Remember a few weeks ago when I showed you how to make some recycled robot wrapping paper for a robot themed birthday party my fam was attending? Well for that same party I decided to whip Baxter up a robot onesie. If you can cut out a square and a rectangle, you can make this design. The first thing you need to do is decide on what your robot is going to look like and what colors you will use. I found that a robot is very easy to construct using squares and rectangles in various sizes. I also decided a hot pink heart would be a nice touch. Truthfully, I'd wear this robot so even if you don't have kids this idea would work. I love love love these sparkly Shimmer Transfer Sheets. They remind me on the glittery iron-on's you had in the 80's. 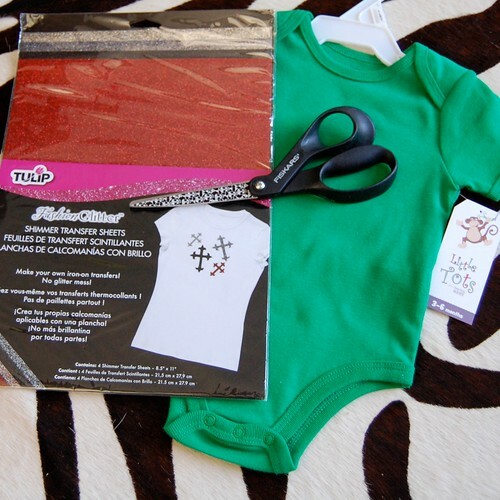 Place your shapes on the onesie in the desired pattern and iron in place. All that is left to do is let the onesie cool, slip it on your rugrat and head out to a robot themed birthday party! I have a few sheets left of shimmer transfer sheets just begging to adorn a super hero cape. Keep your eyes peeled, how-to post coming soon. Check out more of my I Love to Create posts! I like this robot concept. And i hope this project will receive good appreciation and support. Thanks for sharing this information. Baxter is so cute in his robot onesie! Great way to show glittery shimmer for boys. And I love the brother/sister photo, too! Thanks for sharing.